In stock now for just £135.99 including VAT! Hurry while stocks last! 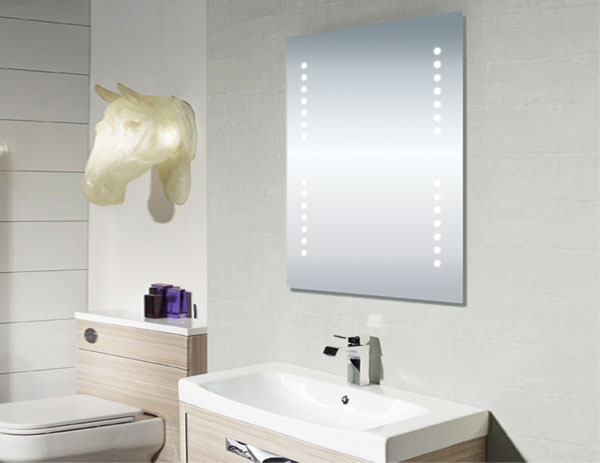 Thanks to its combination of great value, superb quality and stunning looks, the new range of LED backlit mirrors from VIP Bathrooms is sure to impress your guests. Providing a beautiful focal point thanks to their sublime modern looks, the mirrors in this range are the perfect finishing touch for your bathroom. Available in five stunning new designs, these are innovative bathroom additions which will certainly make your bathroom stand out from the crowd and create a memorable, lasting impression with all who see them. This range of backlit mirrors are the perfect finishing touch for your bathroom. VIP Bathrooms are pleased to unveil our new range of eye-catching backlit designer bathroom mirrors. Offering a flawlessly smooth finish and an easy to clean surface, these mirrors combine high quality and excellent value into one great package. With a range of five different styles to choose from, you're bound to find the perfect mirror for your home. All the items in this range draw their influence from the latest bathroom trends, ensuring up to the minute designer looks for your bathroom. Combining stunning designer styles with superb value prices, these mirrors are the ideal choice for any bathroom. Thanks to their brilliant LED backlighting, they are sure to impress - and thanks to the highest quality in manufacturing, they are built to last too, ensuring they continue to dazzle for years to come. The mirror measures 600 (h) x 400mm (w) and is accompanied by a superb 5 year guarantee as standard, which is a testament to the outstanding quality of this item.